Learn How To Use Acrylic Paint Correctly as a Beginner | Homesthetics - Inspiring ideas for your home. When it comes to painting, Acrylic is one of the most popular mediums among artists that are just getting started! Compared to the other popular mediums such as watercolor and oil, Acrylic Paint is relatively new. 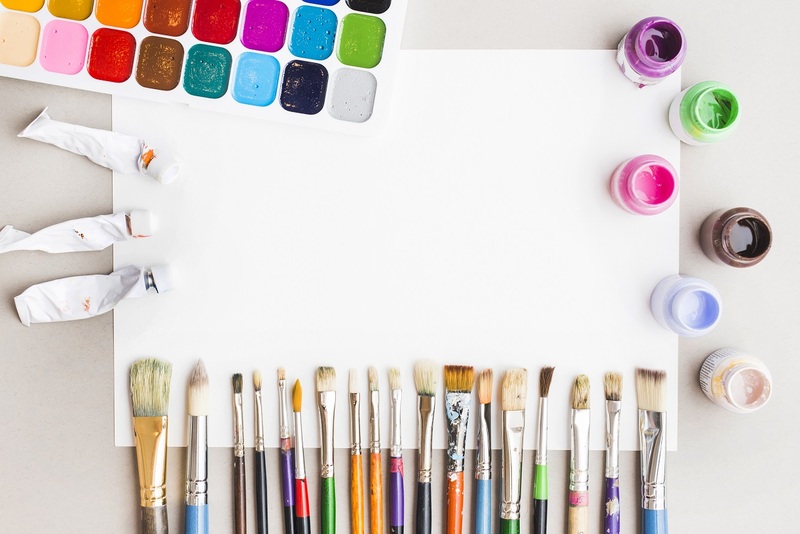 But thanks to its versatility and the ability to produce some fantastic results, Acrylic Painting has quickly emerged as one of the most preferred mediums among professional and amateur painters alike! Acrylic Painting is not too complicated and has a rather easy learning curve when you compare it with the other popular mediums. It’s also relatively hassle-free and works wonderfully in most painting surfaces. 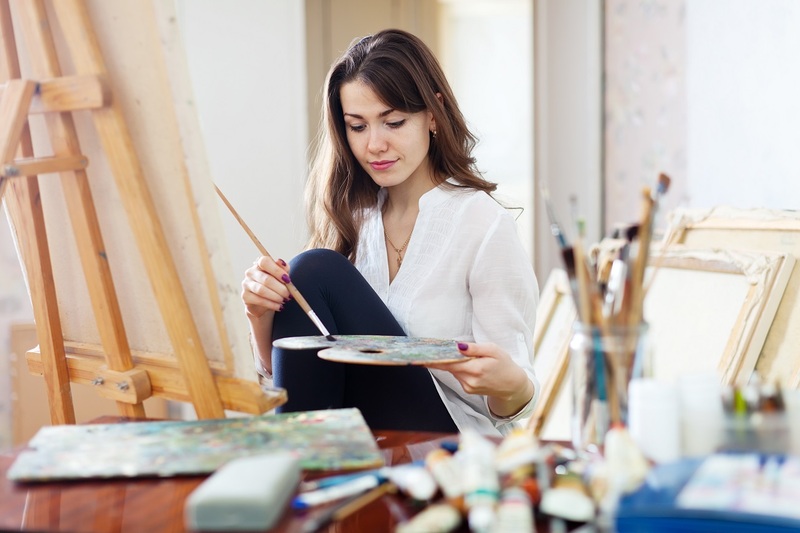 However, if you’re just getting started out, it might come off as a daunting task to get a hold of acrylic painting – especially if you’ve had no prior experience in this field. But with the help of the right guidance and the right equipment, it won’t be long before you start to master this form of art! This article covers some of the basics of Acrylic Painting and provides some invaluable tips and tricks that will go a long way in helping you with your art. It also talks about some of the essential Acrylic Painting materials that every artist needs to get started with this art. 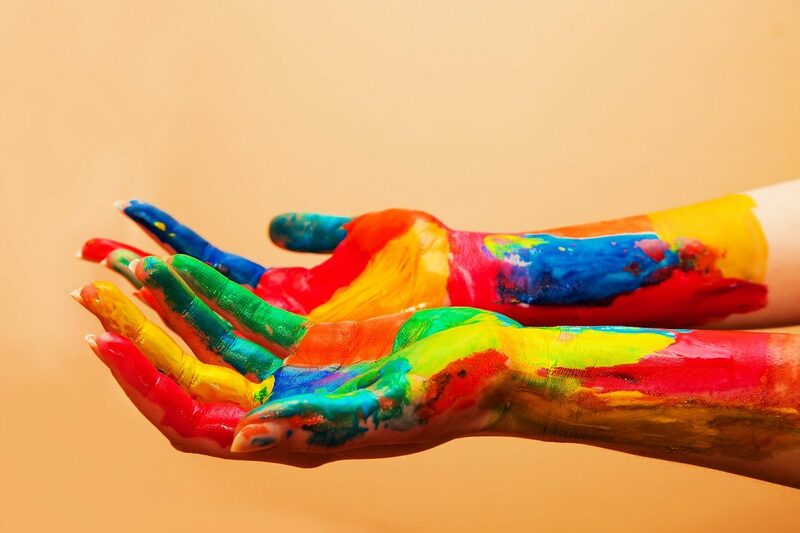 Types of Acrylic Paint – What Should You Buy? The most primary equipment that you’d need to get started with Acrylic Painting is obviously the paint itself! Acrylic Paints, however, vary in terms of quality and price, and so as a beginner – we recommend you start out with something inexpensive. Getting professional grade acrylic paint is an unnecessary waste of money because you’d not have developed the required skillset to work with those paints. Unless you’re a professional painter whose art sells in museums and galleries, we recommend you to get student grade acrylic paints. Even if you’re someone that has a decent amount of experience, student grade paints are the best choice for hobby level painting. Now, of course, we aren’t trying to discourage you from experimenting with more expensive materials once in a while. But buying professional grade acrylic for casual painting is kind of unnecessary! While obviously there’s a significant disparity in quality between student grade and professional acrylic paints, the former will achieve you desirable results. After all, it’s the technique and effort of the painter that produces amazing art, rather than the materials used in them. Winsor and Newton 12 Piece set – This one is for all the professional acrylic painters out there. One of the best quality acrylic paints at an incredibly affordable rate. Golden Acrylic Introductory Set – If you’re starting out with acrylic painting, this is one of the most value-for-money set of acrylics out there in the market. In contrast to watercolor and oil-based mediums, Acrylic Paints are unique in the fact that they have a super-quick dry time. This is one of the biggest complaints that artists have against this medium. When compared to oil-based mediums that can take days, even a week, to completely dry, Acrylic Paints take barely 30 minutes! This super-fast drying time is bad news for your brushes! If you’re not fast, and careful, when removing acrylic paint from your brushes, they are bound to get ruined. This is precisely why I advise people starting out with acrylic paint to buy Starter Sets instead of professional quality brushes which can be pretty expensive. You are almost a hundred percent likely to burn through quite a few of your brushes before you finally figure out how to take care of these things properly. So until you do get the hang of it, it’s best to save money and buy budget-friendly brushes. However, once you’ve gathered enough experience and feel confident about moving on to the next level – professional-grade brushes are a must! Blick Academic Set – Perfect for students that are just getting started with acrylic painting. They come in two different sets – large and small. Stanislaus Brush Set – Best value-for-money when it comes to beginners’ brushes. Not recommended for professionals, but great for getting the hang of the basics of acrylic painting. 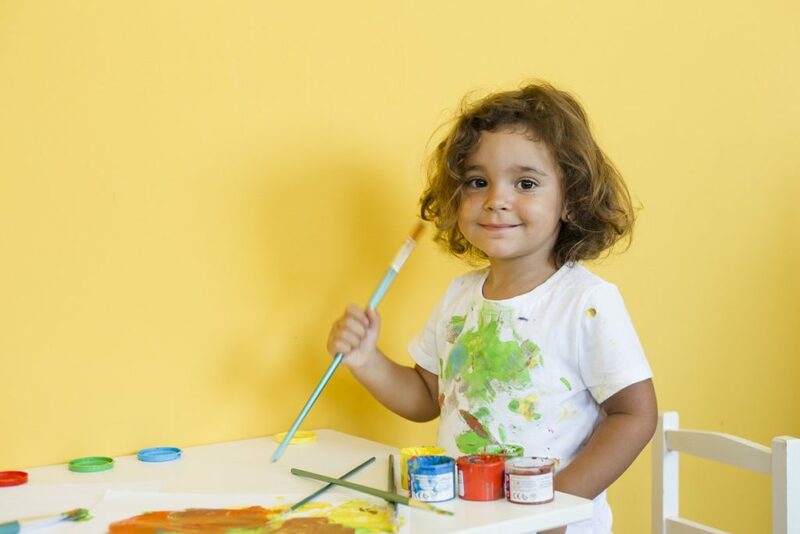 As we discussed in the previous section, Acrylic Paint dries exceptionally quickly and hence can be disastrous for your clothes, walls, and carpets if it gets spilled. Removing Acrylic Paint from carpets and clothes is possible, but it takes a lot of effort. So instead, it’s a much wiser option to take precautions because as a beginner – you’re bound to create a bit of a mess. Before every painting session, make sure to lay down a piece of cloth or a blanket on the ground. This will protect your carpet from getting ruined. Newspapers work too, but the noise they create every time you move your feet is kind of annoying. While you may think you don’t need all these unnecessary hassles, and you can simply prevent these mishappenings by being careful, well let me tell you – it is bound to happen. The smallest of distractions can wreak havoc on your clothes and carpet, so make sure you take precautions! One of the most attractive features of Acrylic Painting is its versatility. While there exist limited options of painting surfaces in other mediums, you can paint on almost any kind of surface using Acrylics. From traditional mediums such as canvas to a whole range of non-traditional surfaces such as wood, glass, plastic, and cardboard – the options are endless! However, irrespective of the surface you decide to work with, you’d need to have gesso available at your disposal. Gesso is a type of primer that is derived from acrylic and adheres to any surface that acrylic may stick to. It provides an enhanced level of texture and absorbency qualities to your painting surface. Gesso is usually available in the color white, but you can also get black and clear gesso. These types of gesso are generally applied to non-traditional surfaces to allow for the original texture of the surface to shine through. While Gesso is excellent, a much more appropriate option for beginners would be traditional primed canvas. Paneled Canvas is a particularly great option for beginners, rather than stretched canvas, as they are significantly cheaper. You can easily practice as much as you want without having to shell out a ton of money on it. Blick Canvas Panel Classroom Pack – Excellent for beginners that are just starting their experimentation with acrylics. Highly affordable pre-primed canvas panels. Mixing of colors can be a little tricky when it comes to acrylic painting, so get yourself a proper acrylic palette before you get started! 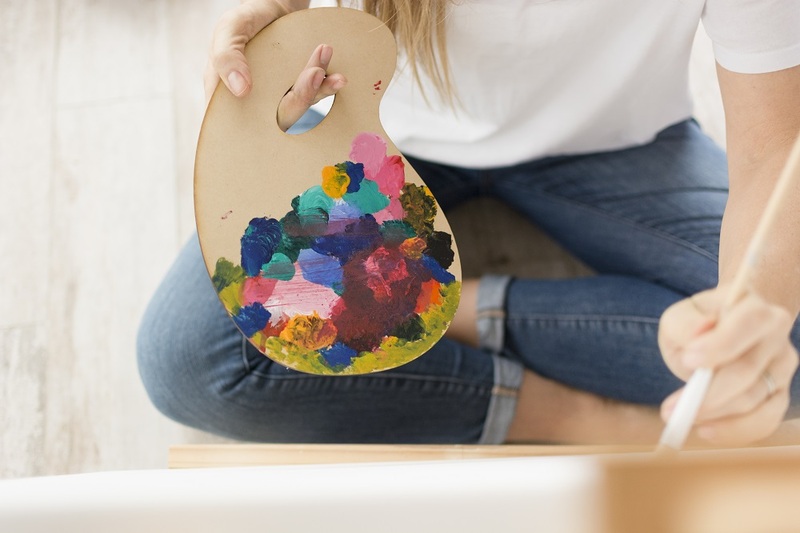 While typically, the palettes used for most mediums have a walled surface which separates different colors from one another – acrylic pallets are a little different. We recommend you to for a completely flat surfaced palette with no separations. A good example would be a flat piece of glassflat piece of glass. Now you must be thinking why in the world would you be using a piece of glass for mixing when there are professional palettes available? Well, the reason behind that is a flat surface, like a piece of glass, would allow you to use palette knives for mixing, rather than brushes. By using palette knives for mixing, you’re much more likely to get more consistent and superior colors. Cleaning a flat surface is also significantly easier. All you need to do is scrape clean the glass surface using a sharp razor. Glass Palette – Great for artists using the acrylic medium. Allows for efficient mixing of colors. Palette Knife– One of the staple equipment when it comes to acrylic painting. You can use it for mixing colors directly on the canvas or your palette. When it comes to acrylic painting, you don’t need harsh solvents such as turpentine and mineral spirits for cleaning off errors. So just in case, you make a mistake while painting, you can easily rub it off using a piece of cloth. Same applies to when you accidentally spill of fling some colors on to your walls or any other surface. So make sure to have plenty of rags available at hand when you’re engaged in a painting session. Although you don’t necessarily require any particular type of material for the cleaning purposes, it’s recommended you use a natural fabric. People often use paper towels, but why waste them when a piece of rag can take care of the stains? Here’s the one I use – Microfiber Cleaning Cloth – Can be used for a variety of purposes. Makes use of highly absorbent materials. A dirty brush is always an undesirable thing to have, irrespective of the medium you’re using to paint. They can significantly dull out the naturally vibrant pigment that acrylic colors possess, and thus lower the quality of your artwork. When it comes to acrylic painting, water is the natural solvent. So for beginners, employing a double bath system is highly recommended when painting. What is the double bath system? Well, making use of two, instead of one, jar to clean off your brushes while painting is what we call the double bath system. It can go a long way in improving the quality of your art but producing more vibrant mixtures. Use the first jar for an initial deep rinse of the brush you’re working with. Make sure you clear off most of the paint from off of the brush while rinsing within the first jar. Use the second jar for a final rinse to clean off any trapped paint that may stick to the brush. You’re bound to notice an improved result by using this method! We also recommend you make a habit of cleaning your brushes more often during your painting sessions. This will make it less likely for the acrylic residue to dry around the base of the bristles, thus elongating the life of your brushes! One of the best things you can do to improve your art is to get yourself a proper easel that matches your style! 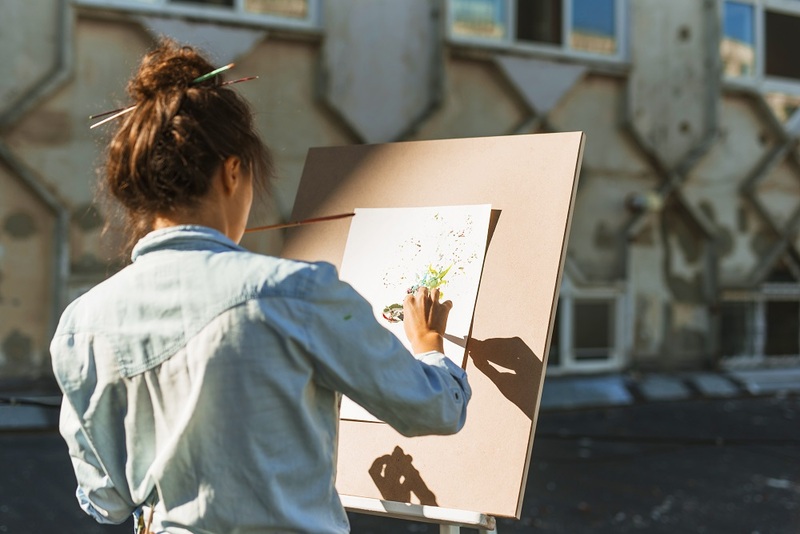 While many artists do not use easels and prefer completely flat surfaces for painting, I would still suggest beginners to play around with these things to see if they do make an impact. Apart from being much more comfortable, these things ensure that you get a proper perspective of your painting, rather than a slanted and skewed one. Easels come in different types, and whether you prefer standing or sitting during painting – you’re sure to find one that matches your style. The Portable Easels are an excellent option for those of you that prefer standing while you’re painting. The design is similar to a framed easel, except you can carry these things around with you. Portable Easels are great for painting outdoors, especially in metropolitan cities where space is often limited. A framed easel is probably the best option for a beginner as these things are easily able to fit in most of the surfaces that both beginner and intermediate artists tend to use. These Easels have a sturdy base, combined with a collapsible design which makes them great for artists that do not have a studio at their disposal. Table Top Easels are for those of you that prefer sitting down while painting. American Easel A Frame – With an entirely wooden frame, these are one of the sturdiest easels you can get a hold of in the market. With an affordable price tag, these are an excellent option for starting out. Ohuhu Field Easel – One of the best portable easels in the market. Very lightweight and can be used by both professionals and amateurs alike! Most types of paintings have different layers that go into achieving the final artwork. However, the most important one when it comes to acrylic painting is the Underdrawing Layer. This is because the underdrawing sets up the entire base for further work, and without a proper base, the final result will most likely get messed up. Most artists working with acrylic begin with an initial sketch of the subject they are going to paint. Charcoal and Graphite happen to be the most common materials used for these initial sketches. Both Charcoal and Graphite have their own set of pros and cons, so we recommend you to experiment with either of the two and use the one that’s more suitable to your style. However, when using Charcoal, it’s essential to use a fixative after you’re done with the initial sketch. This will make sure the charcoal particles stay fixed to your painting surface and not get mixed with the paint when you start painting. There exists a ton of different varnishes when it comes to acrylics! So make use of these incredible products to improve the appearance of your artwork significantly, while also elongating its life. Varnishes allow you to impart a wide range of finishes to your painting. From a full gloss look to a matte finish, you can give almost any type of finish to your painting. 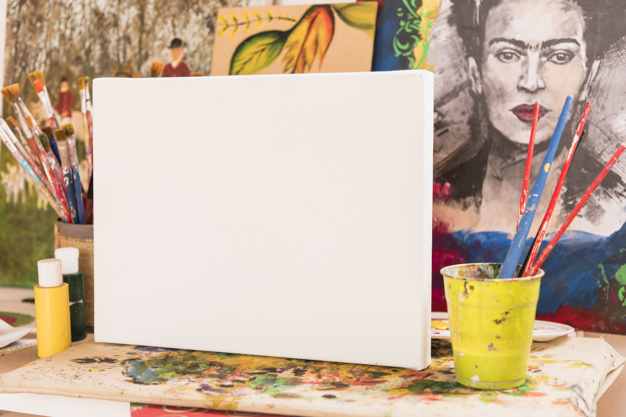 While this isn’t necessarily something that you as a beginner should be worried about, but if you ever wish to present your artwork at a gallery – make sure you varnish it properly. It will make your art more noticeable to the eyes of an average spectator. Liquitex Varnish – Extremely affordable, professional-grade varnish that comes in a wide range of finishes. Recommended for both beginners, as well as professionals. Getting started with Acrylic Painting can be a bit of a challenge for people inexperienced in painting. However, as is the case with any form of art, lots of practice will allow you to master this art in a short period of time. We hope our article will help get you started, and we wish you all the best for your future!